Meanwhile, Steven Miller tells a congressional hearing that the agency made mistakes but did not break any laws or engage in a cover-up. J. Russell George, the Treasury inspector general for tax administration, testified alongside ousted IRS head Steven Miller, who did little to subdue Republican outrage during hours of intense congressional questioning. Both defiant and apologetic, Miller acknowledged agency mistakes in targeting tea party groups for special scrutiny when they applied for tax-exempt status, but he insisted that agents broke no laws and that there was no effort to cover up their actions. Kraushaar said the disclosure was part of a routine briefing about the office’s activities. The Treasury Department issued a statement Friday saying officials first became aware of the actual results of the investigation in March of this year, when they were provided a draft of George’s report, a standard practice. George’s disclosure came before the House Ways and Means Committee in the first of several congressional hearings on the matter. He was joined by Miller, who spoke publicly about the controversy for the first time. But the hearing turned prickly when Miller insisted he did not deceive Congress, though he repeatedly failed to reveal the controversy last year when he was asked about it by lawmakers — even after he had been briefed. “I did not mislead Congress or the American people,” Miller said. The administration is on the defensive for a trio of issues that are threatening to derail the president’s second-term agenda. In addition to the IRS case, President Barack Obama and other officials are being pressed about last September’s terrorist attack in Benghazi, Libya, that killed the U.S. ambassador and three other Americans, and the government’s seizure of Associated Press telephone records as part of a leaks investigation. Committee Democrats were also critical of the IRS, but several took offense at Camp’s assertion that this matter is part of a wider problem within the administration. They noted that there has been no evidence so far that anyone outside the IRS was involved in targeting conservative groups. “If this hearing becomes essentially a bootstrap to continue the campaign of 2012 and to prepare for 2014, we will be making a very, very serious mistake,” said Rep. Sander Levin of Michigan, the top Democrat on the panel. Levin said Lois Lerner, who heads the IRS division that makes decisions about tax-exempt groups, “should be relieved of her duties.” Lerner is the IRS official who made the scandal public May 10 in what Miller said was a planned event at a legal conference. Obama forced Miller to resign this week though he will remain on the job a few days until a new acting director takes over. Obama named Daniel Werfel, a top White House budget officer, to replace Miller and met with Werfel on Friday. Miller is a 25-year IRS employee who was a deputy commissioner when the tea party groups were being targeted. In that job, Miller was over the division that dealt with tax-exempt organizations. 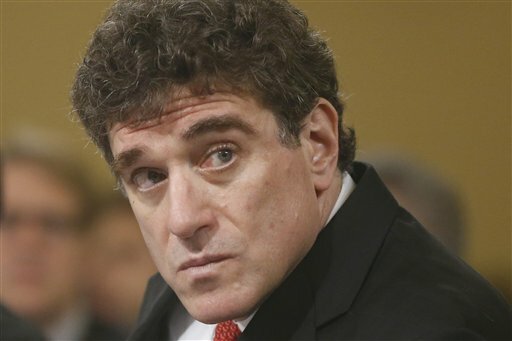 He became acting head of the agency in November, when IRS Commissioner Douglas Shulman’s five-year term expired. Shulman had been appointed by President George W. Bush, a fact highlighted by several Democrats at Friday’s hearing. Camp said Miller’s departure wouldn’t be enough. “The reality is this is not a personnel problem. This is a problem of the IRS being too large, too powerful, too intrusive and too abusive of honest, hardworking taxpayers,” Camp said. Two other committees have hearings scheduled for next week, and the Justice Department has launched its own criminal investigation. Miller is also scheduled to testify on Tuesday before the Senate Finance Committee. He will be joined by Shulman and George. Underscoring the seriousness of his testimony Friday, Miller was sworn in as a witness, an unusual step for the Ways and Means panel. He told committee members that before the episode became public, he had no contact with the Treasury Department, the White House or Obama’s re-election campaign about targeting conservative groups. He surprised committee members when he said “it is absolutely not illegal” for IRS agents to single out conservative groups for additional scrutiny. George, the inspector general, backed up Miller’s assertion when he said the yearlong investigation did not uncover illegal activity. “It is not illegal, but it was inappropriate,” George said of targeting conservative groups. George’s report concluded that an IRS office in Cincinnati, which screened applications for the tax exemptions, improperly singled out tea party and other conservative groups for tougher treatment. The report says the practice began in March 2010 and lasted in various forms until May 2012. Agents did not flag similar progressive or liberal labels, though some liberal groups did receive additional scrutiny because their applications were singled out for other reasons, the report said. The IG’s report blamed ineffective management in Washington for letting the inappropriate singling out occur for so long. Miller said he was notified that conservative groups had been singled out for additional scrutiny on May 3, 2012. After he was briefed, members of Congress repeatedly asked the IRS about complaints from tea party groups that said they were being harassed by the IRS. But Miller was not forthcoming back then about groups being targeted in at least two letters to members of Congress and in testimony before a Ways and Means subcommittee. “Didn’t this committee have the right to know that groups were treated differently?” asked Rep. Dave Reichert R-Wash.
“I answered all the questions I was asked,” Miller replied. “So your answer is a non-answer, once again,” Reichert retorted.